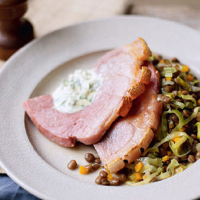 A dollop of parsley cream melts in to a sauce on this tasty gammon dish. Melt the butter in a wide pan; add the carrot and leeks, season, cover with a lid and cook gently for 10 minutes until soft. Stir in the stock and lentils and bring to the boil. Simmer for 5 minutes to warm through. Meanwhile, preheat the grill to high. Snip the fat around the edge of the gammon steaks with scissors. Grill them on a rack for 8–10 minutes, turning once, until golden. Stir together the crème fraîche, parsley and mustard; season. Cut each steak in half and serve with the lentils. Top the gammon with a dollop of the parsley cream, which will melt a bit to make a tasty sauce.